Top Gear presenter Jeremy Clarkson has been suspended by the BBC after he was involved in a "fracas" with a producer. Clarkson, 54, was in trouble several times last year, and the BBC had put the politically incorrect but popular presenter on a final notice following a racist remark made on air in May 2014. He is reported to have hit producer Oisin Tymon, 36, because no food was prepared for the presenters after they finished filming in Newcastle. Here are five things about the outspoken British celebrity. 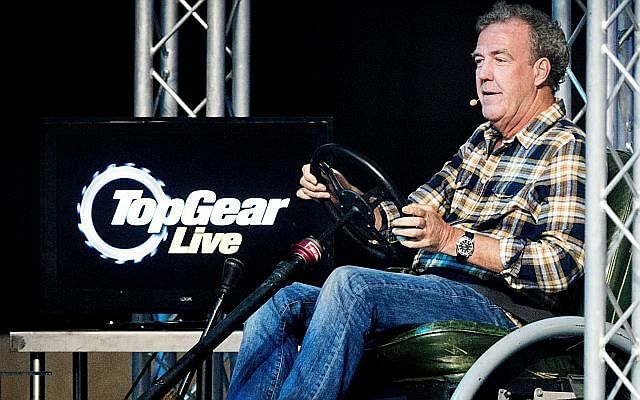 Clarkson has hosted the car review show since 2002, and is credited with making Top Gear one of the BBC's biggest shows, drawing 350 million viewers a week in 170 countries. A petition on Change.org to reinstate him at the BBC has already drawn more than 380,000 signatures as of Wednesday night. His list of recent offences have been repeated ad nauseum in every write-up about the suspension,but his controversial quotes are endless. He has suggested that workers on strike be "executed in front of their families", and described Mexicans as "feckless" and "lazy", then insisted they would not complain because "at the Mexican embassy, the ambassador is going to be sitting there with a remote control like this [SNORES]". He also called former British Prime Minister Gordon Brown a "one-eyed Scottish idiot", and has made fun of disabled people, homosexuals, Asians and once said that lorry drivers murder prostitutes. Despite constantly getting into trouble with his mouth and destroying dozens of cars on screen, he has a relatively clean record when it comes to driving. Clarkson got demerit points on his driving licence for speeding last October for the first time in 30 years. Clarkson seems to have an inability to sit still, and he made fun of it in his book The World According To Clarkson: "I took ten days off and by 11 o'clock on the first morning I had drunk fourteen cups of coffee, read all the newspapers and the Guardian and then… and then what?" Hours into his suspension, his daughter has jokingly begged BBC to take him back. Clarkson and his co-hosts James May and Richard Hammond seem pretty nonchalant about his suspension so far, going by their tweets. @MrJamesMay No no no. Where Eagles Dare. Much better.